We had a great One Page sketch to work with this week for Sketch Support! Allison added a large heart shape to the background of the sketch, behind the photo area. Instead of going with a solid-shaped heart, I chose to cut a heart outline on my Expression and then fill in the inside with varying sized circles. I changed the photo area on this sketch to two photos, instead of three. The pics weren't the greatest because I took them on my phone, while we were in the car, but I changed them over to Sepia and I think that made a big difference. 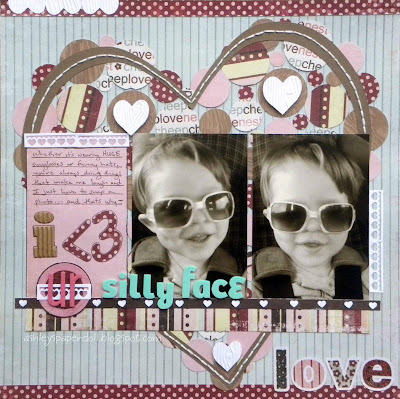 I used the MME paper pack "Love Nest" on this layout. 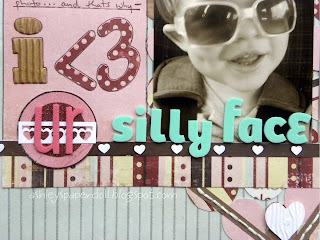 There are some great glittered and textured papers in this pack. 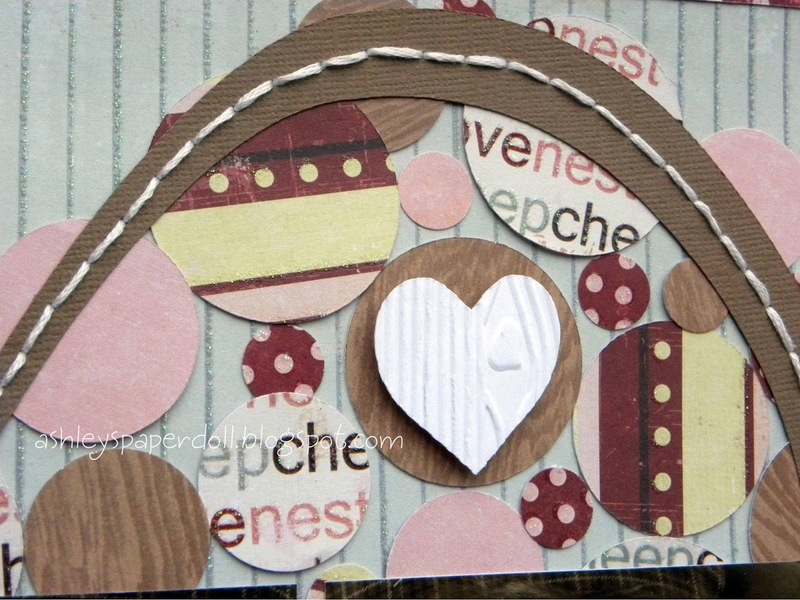 I also added a little extra texture to my page by cutting some smaller hearts, embossing them with a wood-grain pattern, and popping them up with pop dots. I LOVE this layout! The heart with the circles is simply stunning! Your so creative Ashley. Your photos, your tittle, it's all just amazing! Love this!!! Loving those photos, the colors and love love love loveeeeeeee the hearts and that stitching! Ashley you are so inventive! What a cute heart!! The circles underneath are amazing!! 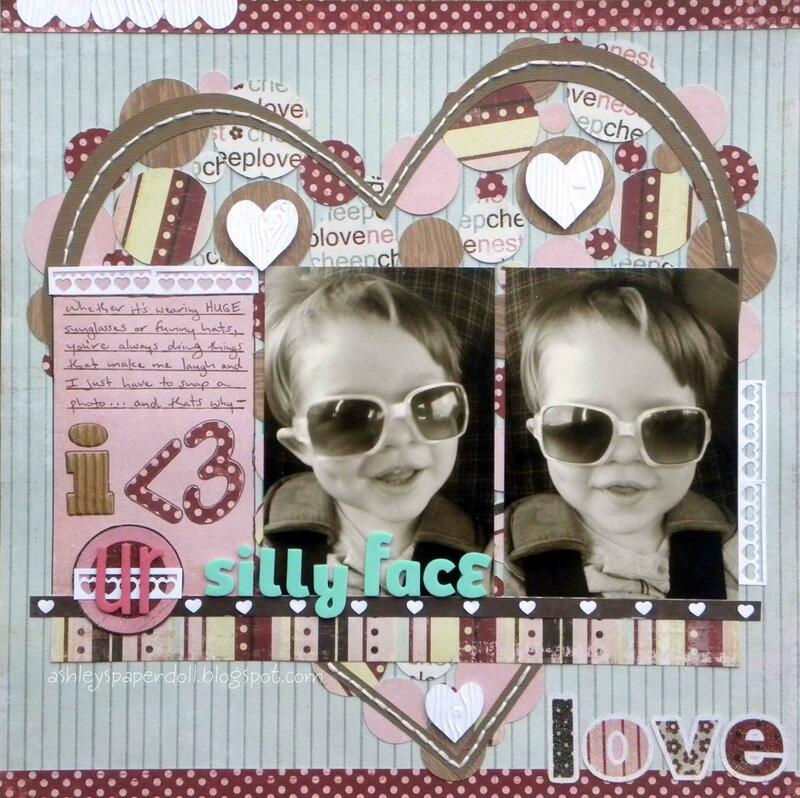 This is a freakin adorable layout Ashley! Love ALL of it! A stunning LO and I love the heart element! Such sweet photos too!! So cute...love the stitched heart and the repeat of the hearts and circles!! A super version of the sketch!! Gotta love those shades!! Wow! I really love your take on this sketch. The heart outline was an awesome idea and I LOVE the stitching. I have a small addiction to stitching. Great photos too.